Class IV cold laser therapy can provide remarkable relief for painful pets. 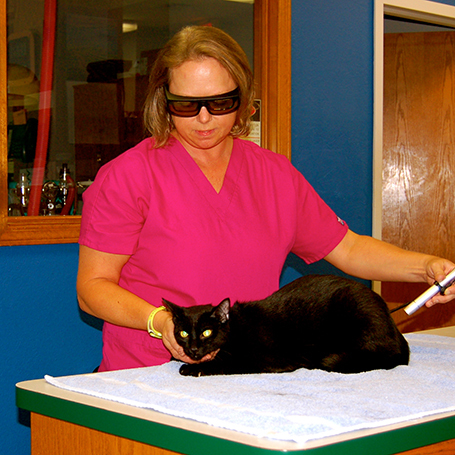 There are so many possible applications for laser therapy in animals. From ear infections to joint pain to hot spots and skin disorders, the use of cold laser therapy can make a world of difference. How does class IV cold laser therapy work? Is there inflammation involved? If the answer is yes, then laser therapy can help reduce that inflammation which alleviates discomfort and promotes healing. Is laser therapy uncomfortable for animals? No, not at all. If you try the laser yourself (it is also a modality used commonly in physical therapy for people), you will see that it comes with a slight tingle and a warming sensation. In time, you pet will learn to associate the tingling with healing and feeling better. When should I consider laser therapy for my pets? In addition, all surgical incisions are treated with laser therapy at Hunters Glen. This depends on the area being treated and the type of treatment being administered. Usually it doesn’t take more than 20-30 minutes. How long will it take for my pet to show improvement? This depends on the pet and the condition, of course. Several sessions may be required before you notice an increase in the overall comfort of your pet or an increase in healing.